The two-photon interference or Hong-Ou-Mandel (HOM) interference is well-known effect which takes place when two indistinguishable photons come at different ports of balanced beam splitter. The HOM interferometry is widely used to measure the degree of indistinguishability of photons and to overcome a time-resolution of detectors. For practical large-scale applications in quantum information processing free-space set-ups are not reliable because of the experimental complexity that is required to achieve and maintain a precise and stable adjustment between the elements and due to the significant size of such systems. However, due to their small size and high stability integrated quantum optical systems are very promising in this direction. We study the HOM interference in integrated LiNbO3 platform with indifused titanium atoms and integrated parametric-down-conversion (PDC) source. 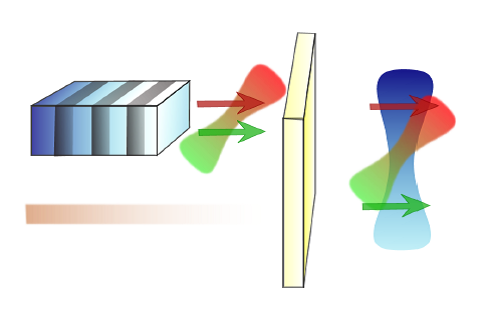 We investigate the properties of such interference, the possibility of creating spatial entanglement in such interferometer, generation of Bell states, influence of arising entanglement on the coincidence probability, different regimes of bunching photons: typical HOM dips (bunching) and singlet Bell states (antibunching). By increasing a number of photons situation becomes more complicated because the four-photon interference is more sensitive to mode structure of radiation. But simultaneously four-photon interference allowing achieves higher resolution and provides more precisely measurement in comparison with the two-photon interference. Moreover with increasing a number of photons the degree of entanglement in the system is also arise. The possibility to create different types of entanglement (spatial, frequency, polarization) and combine them leads to a hyperentangled structure which expand basis for encoding information and gives more possibilities for quantum information algorithms. Beamlike PDC along the pump spatial walk-off. The highest gain is achieved for emission along the pump Poynting vector, which inside the crystal is non-collinear to the wavevector (a). The optic axis direction is schematically shown on top of the crystal. Snapshots with a photographic camera (b–f) show the spectra of high-gain PDC at different crystal orientations: 32.97° (b,c), 33.4° (d), 33.7° (e) and 34° (f). The angular scale is shown in panel b; the grid is the same for all panels. Additional stripes in d,e are due to the reflections in the crystal. Emission at the walk- off angle and in the phase-matched direction is enhanced. This occurs, at different crystal orientations, for different colours (d–f). A snapshot with a neutral-density filter (c) shows colours without the saturation. With increasing pump power significantly it is possible to create non-classical states of light with huge photon number per mode. Bright squeezed vacuum is characterized by high photon number correlations, strong correlations between frequency and space modes that make such state of light very promising for different applications in quantum information and quantum optics. The structure and properties of such states of light are different from the biphoton pairs regime and the perturbation theory methods do not work in such situation. That is why new methods and approaches are needed. We investigate spatial and frequency properties and arising strong correlations in BSV from the point of view of collective broadband (Schmidt) modes. We study the mode structure of radiation, dependence of the multiphoton correlations and the mode content with the parametric gain, walk-off effects, different schemes of BSV generation, high-order orbital angular momentum (OAM) in BSV and their strong correlations, etc. Also we study time-ordering effects in BSV which become crucial with increasing photon numbers. The time ordering effect means that local photon creation processes in nonlinear media must be ordered in time and manifest themselves, for example, in the broadening of the spectrum with increasing pump power. A sketch of the non-linear SU(1,1) interferometer. A broadband PDC pulse is generated in a strongly pumped nonlinear crystal; the PDC pulse spreads and chirps after propagation in a medium with group velocity dispersion (GVD); the spread and chirped PDC pulse is amplified in another crystal, using the same pump pulse. The frequency spectrum after the second crystal is narrower than that after the first one. A configuration with two non-linear mediums where PDC process takes place and dispersive medium between allows to create SU (1,1 ) non-linear interferometer. Such type of interferometer is very stable to the external losses and simultaneously very sensitive to the external phase of signal, idler or pump photons. Such properties make SU(1,1) interferometer very promising for measuring procedure. We study SU(1,1) interferometry in spatial and frequency domain with using biphoton pairs and BSV states in bulk optics and also in integrated platforms. We investigate the properties of such interferometer in the low and high gain regimes and the possibility of creation single mode source with huge photon number. Integrated single chip SU (1,1) interferometer is a challenging problem which promise a new possibilities in the interferometry.